Norfolk County continues to work locally with businesses and organizations that seek our assistance on downtown revitalization efforts. Please stay tuned for opportunities for you to get involved. In the coming weeks and months, there may be opportunities for volunteers to get involved in activities, initiatives and events in downtown areas of Norfolk County. If you are interested in remaining on the list and exploring these opportunities, click here to select a downtown focus. If you would like to stay informed about this initiative, please subscribe to our Downtown Revitalization newsletter. 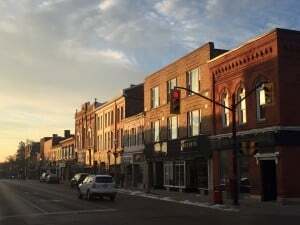 January 30, 2015 – Downtown Simcoe businesses met with Norfolk County elected representatives and staff to discuss establishing an action plan for the downtown. April 9, 2015 – Businesses and County staff / elected representatives undertook walking tour of downtown Simcoe to gather ideas and solutions. May 5, 2015 – Ideas from walking tour shared and discussed. August 5, 2015 – Businesses supported Norfolk County preparing an action plan. Staff get to work preparing a document for next year’s budget. December 1, 2015 – Draft Downtown Master Plan is circulated to businesses and stakeholder groups for feedback. Positive responses and support were received. January 12, 2016 – Norfolk County Council-in-Committee reviewed a report proposing the development of a Norfolk County Downtown Master Plan. February 29, 2016 – South Coast Business Coalition informed Council they will be taking a lead role in the revitalization efforts. It is understood that an update will occur in March. Council puts on hold further development of Master Plan. May 3, 2016 – South Coast Business Coalition made verbal presentation about downtown revitalization to Norfolk County Council-in-Committee. The SCBC offered to take a lead role in the downtown revitalization effort. It has hired a consultant, Jeremy Freiburger of CoBALT Connects. As a result, the development of Norfolk County’s Downtown Master Plan was suspended until the report comes back from the SCBC. August 5, 2016 – The South Coast Business Coalition asks business owners and employers in Norfolk County to complete a survey to explore ideas related to downtown revitalization. January 27, 2017 – Norfolk County Council removes funding placeholder from 2017 budget for Downtown Revitalization, awaiting plan from South Coast Business Coalition. May 29, 2017 – Representative of South Coast Business Coalition made verbal presentation to the Tourism and Economic Development Advisory Board. No written report will be coming forward.